A joint research project between the Museum of London and the Natural History Museum has re-evaluated human remains discovered under the London Wall in 1988. The majority of the remains were recovered from an industrial site in the Walbrook Valley and have been curated by the Museum of London. Because the skull is the first body part to disarticulate, it was first thought that these were skull bones that had separated from the rest of the bodies over time and been washed out from graves. Similar crania are often found in the River Thames. 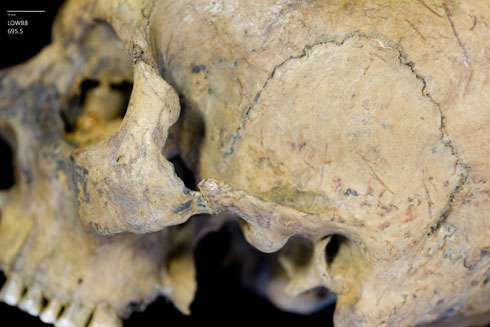 Museum forensic anthropologist Dr Heather Bonney, who analysed the skulls, however, found that many of the individuals had sustained blunt force trauma in the facial area and on the side of their heads around the time of their death. This would suggest several theories, which include that these remains could be the heads of people executed in the amphitheatre near the burial site, or the heads of enemies kept as trophies by the Roman army from the frontiers of Britain, stationed in Roman London. Roman amphitheatres were typically used for gladiator combat and judicial execution. Only a few of the human remains showed signs of the type of decapitation you would expect in judicial execution. The human remains were deposited between AD 120-AD160, which was a time of prosperity and peace in the province, rather than a period of war when human remains exhibiting violent death would have been more typical. Dr Bonney said that similar burial sites for the victims of gladiatorial combat have been found in Europe, but not previously identified in Britain. 'We know gladiator contests went on in London but not the extent of such contests,' she said. The research team said that the next step was to investigate where the people buried in the site came from.